Millimetric precision and speed are not always compatible with superior quality. Just ask a carpenter who makes madeto-measure products with a refined design that requires both time and dedication. For a small carpentry company, no matter how expert and acclaimed it is, increasing production volumes of items built to the specific requirements of an architect or designer, is nearly always impossible. In the same way, if a large, mass-production furniture company agrees to furnish 100-150 apartments with high-level, made-to-measure bathroom and kitchen furniture, it is generally more an operating cost than an effective profit. Small to medium-sized companies that produce only for a specific, high level project or market target exist somewhere between these two opposite poles. This is the case with Piemme Arredamenti, a company that has been operating in the Tuscan countryside for over fifty years. The company’s core business is the manufacture of luxury furniture for major contracts in the hotel, domestic and commercial sectors. Marco Primaveri, the second-generation owner of Figline Valdarno welcomed us to the company. Together with his brother Mauro, Marco took over the company from his father, Primetto, when he was still very young, and he has now been joined by his own son Enrico. 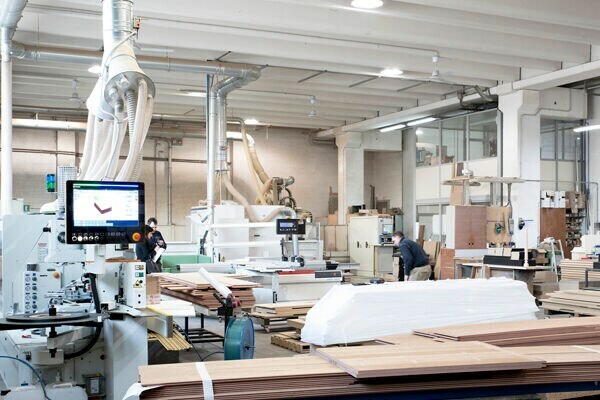 “Our wood machining processes are as important as our metal ones,” says Marco, as he shows us around the carpentry division, “especially the latest machine we have bought from SCM, a stefani md edge bander. 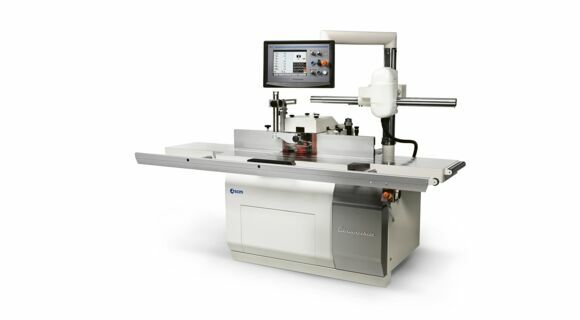 In eight hours it machines 3600 sides, so up to 1800 workpieces a day even when it is operating at halfspeed. 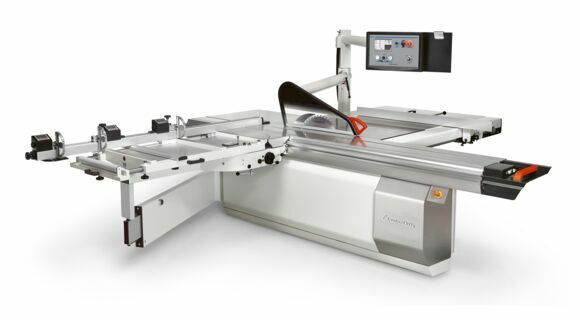 High production is supported by gabbiani panel saws (galaxy 3 and sigma 105) that with theirs quality guarantee cutting perfection. Enrico shows us some panels with a solid woodslat effect that have just exited the numerically controlled tech z 5 work centre. These have been specially made to clad a 50m long x 3m high wall in the flagship café of a well-known international chain in Milan. 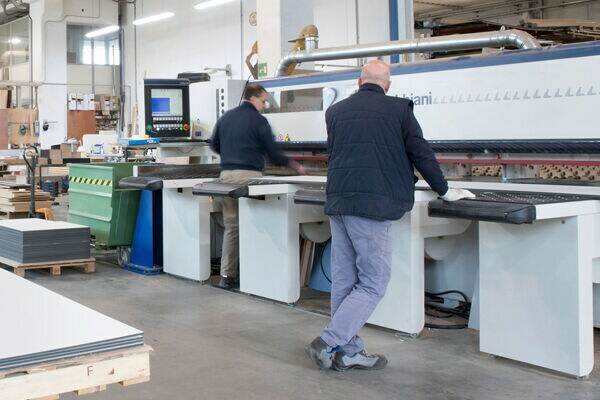 The Tuscan company also boasts a number of other machines, including an Scm sander, an accord 40 panel machining work centre, two classic L’invincibile range machines and a numerically controlled morbidelli cx200 (cyflex hp before rebranding) drilling centre. The metal parts are processed in a separate room as most orders require the use of mixed materials. Marco, Enrico and their staff have recently finished making all the store furniture for a well-known global jewellery chain. The most difficult pieces were a series of elliptical-shaped islands for storing jewellery, made of Canaletto walnut with a stainless steel and glass showcase. The islands were made up of approximately six thousand wooden and metal parts and took the company a whole month to make. “Everything starts from the design, we even mark out the pre-drilled holes for the guides to ensure everything is absolutely perfect,” says Marco. “Customers ask us for a piece of furniture and then give us just a simple drawing and some measurements. We do everything else. In the last two and a half years we have furnished 22 stores with oak furniture, stainless steel showcases and oak veneer clad walls.” For a jewellery store in New Delhi, India, the company made all the furnishings out of ebonised ash. Technology has been a great help to Piemme Arredamenti, but the specific goal that has to be reached for a certain project always comes first. 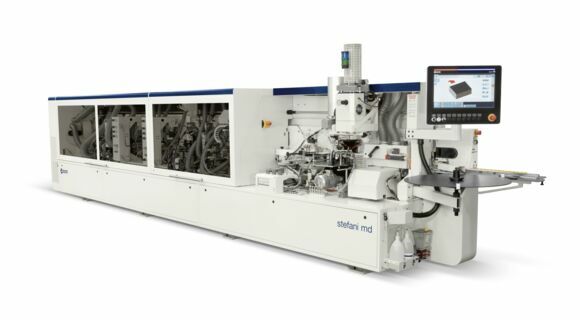 “With SCM, we have invested in technology for the first time ever,” says Marco. “Years ago, it didn’t matter if we took one hour or three over something, as we were producing made-tomeasure products. 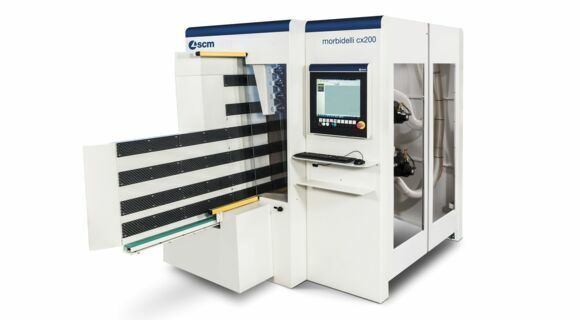 But, then, with the change in generation and the loss of both manual skills and the experience of the older craftsmen, technology became increasingly more important.” One thing Marco is sure about is that SCM has always been a partner he can rely on. “There’s no point in buying machines from a series of different companies, because they won’t work together,” he says. 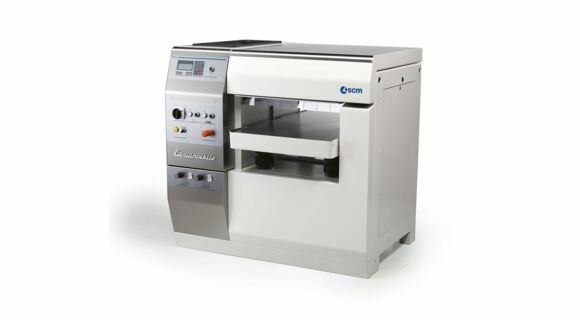 “The first SCM machine we bought was a sigma panel saw, which immediately allowed us to eliminate square trimming. 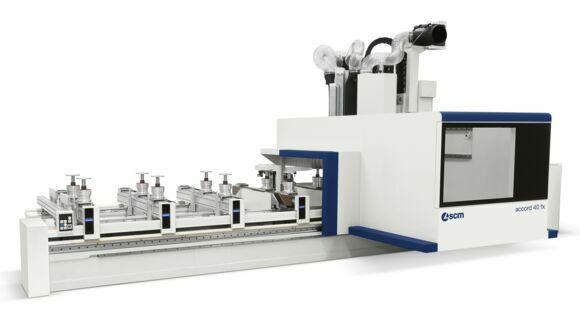 Then, we continued to buy first series or prototype machines, one at a time, which also helped the supplier to get a clearer idea of how the machines could be used.” The next purchase will probably be a drill and dowel inserter machine to speed up drawer production. “There are lots of drawers in the furniture we make, and if you multiply each one by five (four sides and a bottom) the result is a vast number of joints. Thanks to the three work centres we have already, we can drill the holes quite quickly, but when you have 500 drawers to make, no matter how fast you go, it inevitably becomes a bottleneck.” In the end it’s a matter of fitting all the different elements together. If you get even one small piece in the puzzle wrong, you can find yourself out of the picture.